What can go wrong with your Kidneys? How is kidney disease usually treated? How has Kidney Dr. helped others? How do I use Kidney Dr? The kidneys are 2 bean-shaped organs in your abdomen which form a part of the urinary tract. They are responsible for filtering waste products and useful chemicals from your blood and eliminating the waste products into the urine. Without the kidneys, waste products and toxins would soon build up in the blood to dangerous levels and damage your body. Your kidneys regulate the body’s level of necessary substances like water, sodium and potassium. The correct balance of such substances is vital for your body to function healthily, but excess amounts can be harmful. Renin is a hormone important in regulating salt levels and blood pressure. Erythropoietin is vital in the process of red blood cell formation in the bone marrow. The kidneys also produce the biologically active form of Vitamin D which is used for absorbing calcium and maintaining the health and strength of your bones. As with all organs of the body, the kidneys are subject to a range of disorders and diseases. Kidney damage usually takes place gradually and without symptoms and it may only be after years of kidney disease that kidney functioning becomes noticeably decreased. Some people are born with only one kidney or donate one of their kidneys to a family member or friend. These people can live healthy and normal lives as long as their remaining kidney stays healthy. In kidney disease one can lose more than 75% of kidney functioning before the effects become obvious. The two most common causes of kidney disease are diabetes and high blood pressure. If you or your family has a history of these diseases, you may be at risk for kidney problems. Some kidney diseases are inherited, for example Polycystic Kidney Disease (PKD). Infection, direct injury, poisons and drugs (Like prescription or over-the-counter painkillers) can also lead to serious kidney damage or dysfunction. All of the above disorders and diseases can lead to decreased kidney function or kidney (renal) failure. This may happen suddenly (Acute Renal Failure) or, more commonly, gradually over years of disease (Chronic Renal Failure). Kidney stones are also a very common problem. These are formed by clumps of crystals which can block the urinary system. Depending on the size, kidney stones may be passed out in the urine unnoticed or cause severe pain - some may even require surgery. Although there are a number of tests that may be done to establish kidney disease, the urine sample your doctor takes is a common way that kidney problems may be first identified. For example, blood, protein, or white blood cells in the urine may indicate injury, infection, or inflammation of the kidneys, and glucose in the urine may be an indication of diabetes. The treatment of kidney disease will depend on the specific condition and may involve a number of prescription drugs including antibiotics and steroids. The control of blood pressure and diabetes also plays a major role in preventing further damage to diseased kidneys. In the case of kidney failure, dialysis (filtering of the blood by an artificial kidney machine) is required. In severe and irreversible cases of kidney failure, kidney transplant may be necessary. If left untreated, kidney disease can become irreversible and can be a significant threat to your health. People with diabetes, high blood pressure or a family history of kidney disease also need to actively prevent kidney disease and keep these organs in optimum condition. Kidney problems respond well to complementary medicine and a holistic approach (including diet) and these will improve kidney functioning and ultimately decrease the need for prescription drugs or surgery. "As I have been diabetic for many years now, I became concerned about the health of my kidneys. I know that diabetes can damage the kidneys and I have also always experienced urinary tract infections, which I know can become very serious if they spread to the kidneys. On your consultant’s advice I have been using your UTI-Clear and Kidney Dr. remedies. No more UTI’s (which is great) and, even better, I know that my kidneys will serve me well for many years to come!" I started using your Kidney Dr. remedy when I was diagnosed with high blood pressure. As I am also diabetic and my mother died from renal failure, I’m at high risk for kidney disease and was very keen to do anything I could to look after my kidneys. I have been using your Kidney Dr. for a few weeks now and I must say it is wonderful- I already feel healthier and imagine my surprise when my doctor told me my cholesterol levels were down. (Yes, I also have high cholesterol!) Many thanks for a great product!" "Several months ago I donated one of my kidneys to my son. Although I would do it again in the blink of an eye, I felt pretty awful afterwards - apart from the pain of surgery of course. I wanted to help my remaining kidney to start compensating as soon as possible as well as keep it in peak health. I came across your Kidney Dr. and ordered it immediately. I am so pleased I did because it has helped me tremendously. I feel as well as I did with both kidneys- better in fact." Kidney Dr. contains no animal products, gluten, artificial flavours, colours or preservatives. 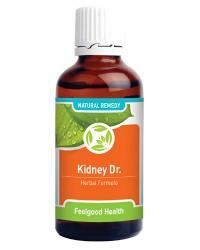 Kidney Dr. comes in convenient tincture (drop) form and is diluted in water or juice. With regular use, results should be noticed within 3 - 6 weeks, although some people may respond sooner. One bottle of Kidney Dr. should last 3 - 4 weeks. Avoid a high protein intake in your diet. Drink at least 8 glasses of purified water daily. If you have high blood pressure or diabetes, keep it well controlled. Kidney Dr. may be combined with our Insulate Plus for Diabetes or our High-Rite and Aqua-Rite for high blood pressure. Quit smoking. Our Crave-Rx formula will help with this process!